… Inviting a dragon into your home will assist in the fulfillment of all of your intentions, as dragons represent and invoke courage, enthusiasm, positive energy and flow. In fact, a properly placed dragon can strengthen your life force, increase prosperity and bring fortune and luck. The American Feng Shui Institute defines feng shui as “the study of how the environment affects those who dwell in it.” A basic principle is to incorporate feng shui’s five elements – earth, wood, fire, metal and water – throughout a home (you can read more about it and how to feng shui your entryway in a piece I wrote for the Houston Chronicle a few months ago featuring wisdom from designer Teri Pugh and feng shui consultant Gina Castellano). Perhaps it’s because I’m a writer, but I’m a believer in the power of symbolism, so if seeing a little dragon image by my faucet each day helps me better slay the dragons of my day and makes me think prosperous thoughts, I’m game. So, the hunt begins for a fabulous dragon. 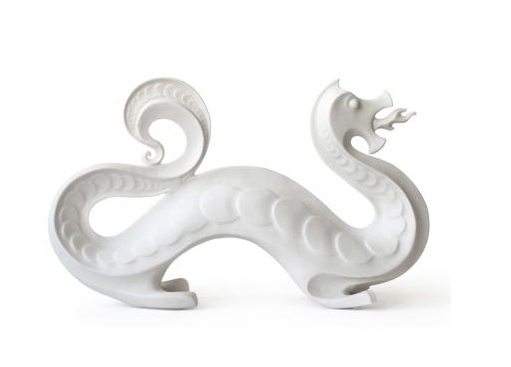 I’m hoping to find a modern one, such as the snazzy guy pictured above, $350, at Jonathan Adler (as a bargain hunter, and one who as much as I believe in symbolism, believes that saving money also increases prosperity, I’m sure I can find a less expensive dragon that’s just as cool, but you get the idea). Here’s to a prosperous 2013 and slaying all of your dragons. What little omens, good luck charms and symbols do you put around your house and why? Yes, an image works too!